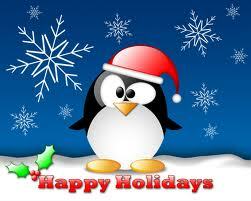 The Mar Vista Farmer's Market and the Green Tent will be closed for the holidays. See you back on January 8th! Sustainable Works is a non-profit environmental education organization and a project of Community Partners. Their mission is to foster a culture of sustainability in cities, colleges, and businesses. Sustainable Works offers programs in Santa Monica and now in Los Angeles! They will be here to sign up willing participants for the next Green Living Workshops, one of which will be offered at the G2 Gallery starting January 25th. Several of us at the booth are happy alums of this important, fun and informative course. See here . In class each week you will spend time learning about the problems related to each of the above topics on a global, national and local scale. Then with the help of the WorksBook, a comprehensive sustainability primer that all participants receive, you will review ten related solutions. There will also be opportunities to receive sustainability tools to help participants carry out the solutions discussed during the workshop! Please stop by to have your questions answered to and say hello! Did you know? : 1 Solar Home = 1,000 Trees. Just one of many surprising facts you will learn this Sunday when Mona Asinovski, a solar consultant for California Green Designs, pays a visit to the Green Tent. Mona is passionate about going solar for all the right reasons. Come visit this dynamic Solar Expert at the MVCC Green Tent this Sunday and learn some surprising facts about going solar in 2012. Solar energy brings you security and independence. Debunking myths and providing information- Most homeowners think that solar is expensive, out of their range, and requires a large down payment. In fact going solar empowers you to lock into current electricity rates instead of exposing yourself to rising LADWP electricity prices. As of this summer, The Los Angeles Department of Water and Power officials say the utility needs rate increases of at least 15 percent over the next three years. SCE is proposing a 7.2% increase in 2012 alone. With the trend toward availability of electric cars, generating your own electricity makes even more sense! Imagine generating your own fuel while you sleep! 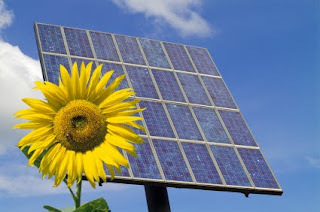 Don't forget, the side effects of solar are a reduction of air pollution, and CO2 emissions. We're talking about up planting over a thousand trees with a single solar installation and less demand for dirty fossil fuel. Solar also supports the US economy. As the solar industry grows, it brings job and infrastructure back to the United States. Supporting this local economy is a great way to bring your area financial stability in the future. By reducing our reliance of foreign oil, we may just be able to halt the high cost in human life that we currently pay for our military presence abroad. Solar energy is about independence, freedom from rising prices and the availability to control your expenditures in the future. 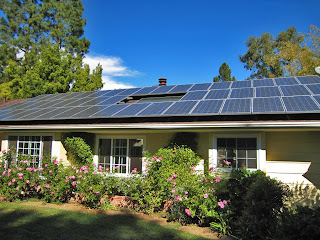 California Green Designs is a local solar company that's been installing panels since 1985. They operate work within a 60 mile radius, and use only in-house staff, with no sub-contracting. They look forward to meeting you and answering all of your questions on December 11th. Stop by and get a free site evaluation! Check them out www.ca-green.com. Mona also sets up sun-worship booths at farmers markets all over LA, and if you catch her, she'll offer you a coconut water, some sunglasses, while you get your solar questions answered. You can follow her @sun_salutations. EnerGtech Experts Return This Sunday December 4th! In case you missed them two weeks ago due to all that rain, EnerGtech has graciously agreed to return! EnerGtech Experts are a geek-squad-of-sorts assisting home owners and businesses to find energy savings with the g-Meter™. 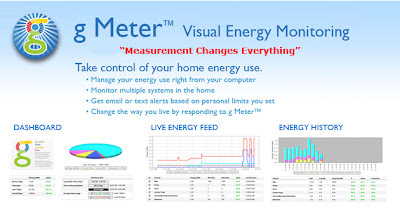 The g-Meter is a “smarter” meter that accurately measures, every 5 seconds, the electricity used by lights and individual appliances in the home. The homeowner can then watch their consumption in live real-time from any web-connected device on their own secure account at greenNet.com. 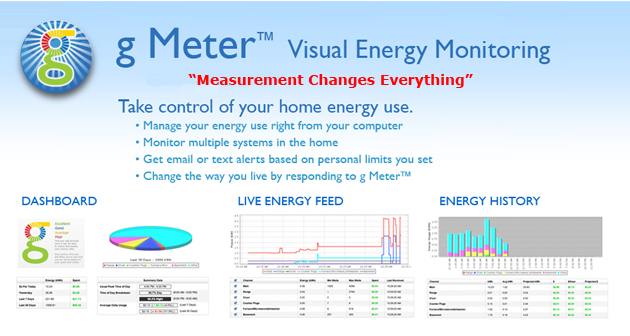 When the homeowner’s utility rates are entered, the g-Meter™ will show what each appliance is costing the homeowner in real-time. If a light or appliance is left on too long, the system can send an email or text message to the homeowner and with additional remote controls, the homeowner can turn them off from their smartphone or computer. By measuring our energy consumption precisely, we can then understand how to manage our consumption and begin to find alternatives on how to lower it. There is no more guess work on how to lower energy bills. Measurement changes everything! Green Tent + Green Living Workshop = Life Changing! You have probably already met Lynda Hammersmith at the Green Tent. Lynda is one of the many people who make the MVCC Green Committee so special. Her story is inspiring in so many ways! In a few short months, Lynda has gone from being a new neighbor to a daily buddy in our work at the Green Tent. How did we ever do it without her? Four months ago I moved to Mar Vista. My first hint that I would be happy here was when I looked down the street of my very nice neighborhood and noticed that all the grass was brown. I asked the landlord, perhaps naively, if we were on water rationing. His response was music to my ears: “In this neighborhood we choose not to waste water that way”. I've been on my own journey to live more sustainably for several years and I knew in that moment that I had moved into the right community. My first Sunday back I decided to walk over to the very local, Mar Vista Farmers Market to check them out. As I wandered through the stalls I could hear live Zydeco music being performed, and smell the different ethnic foods cooking. Then the Green Tent caught my eye. There was a charming woman at the table dressed as a bee! Jeanne, the Green Tent volunteer, greeted me warmly and explained who they were (Honey Love) and what they were about. She explained the mission of the Green Tent was to educate and support sustainable practices and businesses. Then Jeanne introduced me to someone who counseled me on how to build raised planter beds for the vegetable garden I was planting and Honey Love gifted me with a jar of homemade honey-peach marmalade. I was hooked! I asked how I might get involved, shared that I wanted to learn to live more sustainably and that my knowledge, I suspected, was still too limited. I was told about the upcoming Green Living Workshop taught by Sustainable Works. Thanks to the help of Councilman Bill Rosendahl, CD11 had just received the funding to offer this FREE course. The six week class covers six critical areas: water, energy, waste, chemicals, transportation and shopping/food. It was to be both problem and solution oriented and this was important to me. I signed up. Last week we completed our final week. The class was some work but also fascinating, meaningful, helpful and a lot of fun. The material was extensive, surprising and often alarming. As each class is only 1 ½ hours there is much to absorb and then to try to implement. Each session we shared with others on the changes we had made. I found this not only clarifying, but supportive and entertaining. My classmates came up with great ideas! They supported my efforts. I now have a lengthy amount of ‘homework’ which can occupy and guide me for years to come. Some of the changes are easy to make, fun to do and there is even an immediate monetary reward! Some require sacrifice and planning, expense and negotiation with others. A big surprise was in discovering that my green practices weren't all as green as I had imagined. I was still using the resources of 3 ½ to support my life-style. Education helps! This was the tough part because I've been thinking of myself as an environmentalist for years. I also realize that sometimes I’m on the bandwagon and sometimes I’m on the fence. And I guess that that’s ok but the fence has definitely been moved considerably. One of many big shocks: Did you know that it takes over 2400 gallons of water to produce one pound of beef? I’ll never look at beef the same way. I discovered that I can influence others in my life to make similar changes. Again education helps. Explaining the reasons why we are ‘turning off lights that we aren’t using’ is easier when everyone knows how much of our electricity comes from coal and what that really means. I’m still called the Queen of Darkness in my home but my son now wants more organic foods on the table and his friend called to tell me that he had figured out how to take a four minute shower! I realize that this is a process of making choices and taking action. While the tools are there it’s now up to me to keep implementing them. For myself the method that works best is to ask myself each morning; “What can I do today to lower my impact on this planet? “ I refer to the check lists in my workbook and make small changes daily. The next workshop starts on Wednesday, January 25th at the G2 Gallery on Abbot Kinney - you can register here! BTW- I now volunteer at the Green Tent on Sunday, come by and see us! 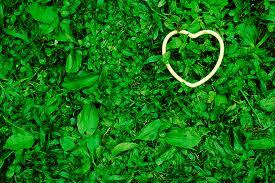 It’s a quick and friendly way to integrate into our wonderful, green community. 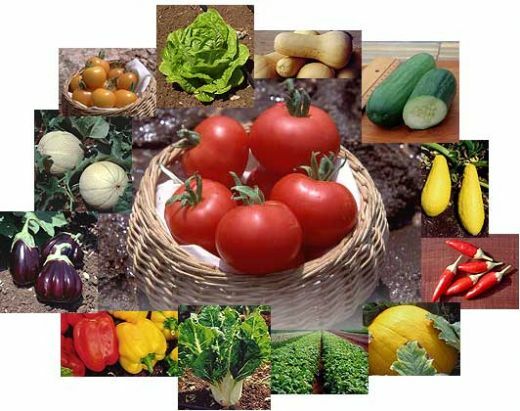 The UCCE LA County Master Gardeners are back with seeds, seedlings and advice to give away at the Market on Sunday 10/23. Nov. 27 is the 4th Sunday of the month(*) and that means The UCCE LA County Master Gardeners will be on hand to deliver you some healthy greens for the holidays -- micro greens, arugula and some herbs to enhance your post-Thanksgiving table. Plus: ask us what you can do in Winter to keep your garden productive! (*) No booth in December - the 4th Sunday is Christmas Day -- so this is your last chance till the 4th Sunday in January for free seeds and seedlings !! Since 1978, UC Cooperative Extension's Common Ground Program has made gardening possible for many Los Angeles County residents, particularly low-income and traditionally underrepresented families. The program goals are to improve nutrition; increase access to fresh, low-cost produce; offer gardening education; build bridges between neighbors and communities; help create employment opportunities; and encourage a cleaner, greener Los Angeles. We are thrilled to have them as our guest at the booth on the 4th Sunday of every month! Families learn how to garden, grow their own food and prepare it in a healthful manner. In addition, the program trains community volunteers and Master Gardeners, who in turn, volunteer their time to community and school gardens. This is a wonderful program - you may even want to explore signing up for the Master Gardener volunteer training program! 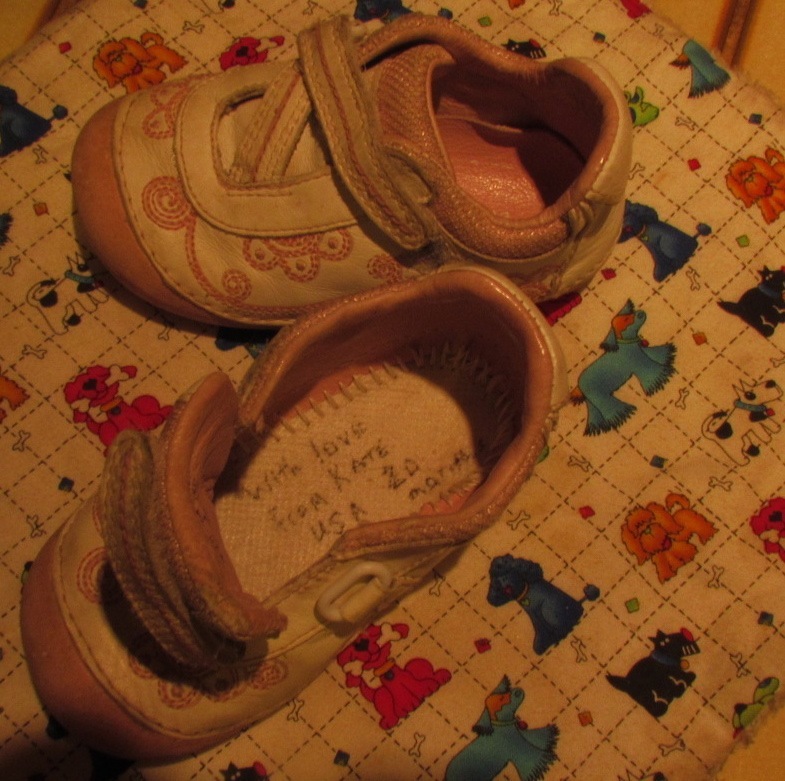 Kate's First Shoes - and 900 others! 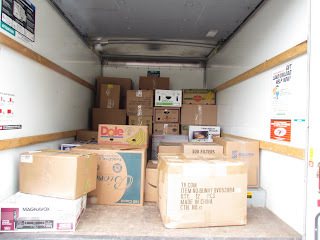 The MVCC Green Committee 2011 Soles4Souls shoe drive is over. On Friday, October 11, Melissa Stoller (with help from her son Jeremy) delivered about 900 pairs of shoes to the Soles4Souls warehouse in Fontana. 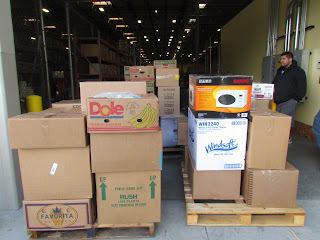 From the warehouse, Soles4Souls distributes shoes wherever they are needed. Just imagine! 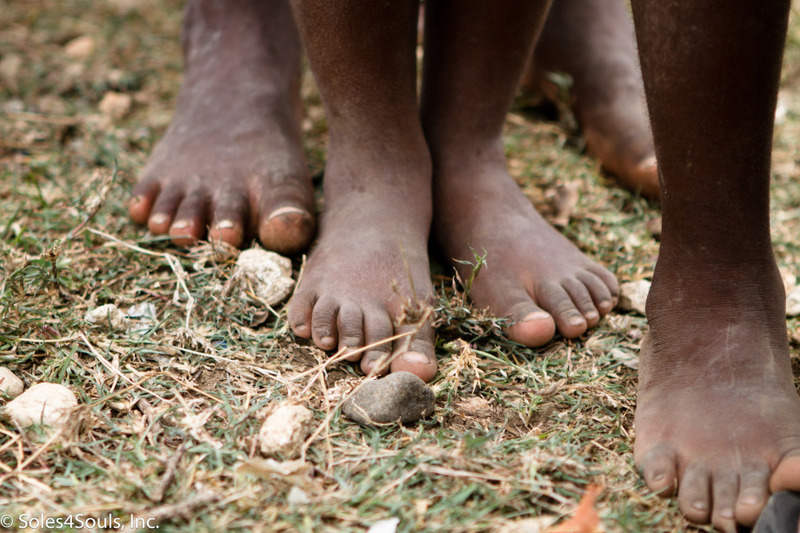 Your shoes might enable a child to attend school or prevent disease for someone unable to afford shoes or provide relief for a disaster victim. Perhaps they’ll be used to start a micro-business, providing an income source for the entrepreneur and a low-cost shoe source people with limited means. They certainly won’t be taking up space in our landfills or leaking toxic glue into our environment. Thank you to everyone who donated shoes, even braving the rain October 6 to bring them to the Farmers’ Market. Thank you to the employees of the Radisson LAX who participated for a second year. Thank you to Chris de la Vara and Manu International beauty salon for the over 200 pairs of shoes you collected. Thank you to everyone who helped at the Green Tent. Melissa will be back at our Farmers’ Market collecting shoes for Soles4Souls October 14 & 21, 2012. Melissa returned home from the warehouse to find six pairs of shoes waiting on her porch. She doesn’t have space to store large numbers of shoes until next October. The Soles4Souls motto is “Changing the world, one pair at a time.” Maybe you can help change the world one box at a time. Find an out-of-the-way space in your home or garage and save the shoes you discard during the year. When a neighbor has a garage sale, ask if you can have any leftover shoes. If everyone does a little bit, starting now, we can completely fill the truck next year! Thank you, Melissa, for bringing this wonderful tradition to Mar Vista!! Our Green Booth guests this week are doing just that with their home and body care products. Typically we purchase these products in disposable or recyclable containers - but Refyll has created alternative options to this wasteful packaging. Enter to win a starter basket of Refyll’s products! 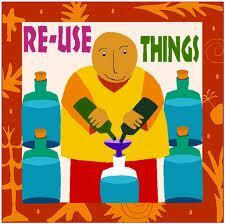 ~ Just bring your used glass jars and bottles with lids for Refyll’s upcycling instead of recycling. Refyll basket includes many safe, simple, locally made natural products. Stop by to receive info, samples, kiddy treats, and to drop off those used glass jars and bottles with lids Sunday November 13th. I am a shoe-aholic. I love shoes. I love to shop for shoes. A simple rule keeps my abit under control: if there isn’t room for a new pair in my shoe cabinet (yes, I have a shoe cabinet) something must go. Last year I decided to get rid of several pairs of shoes. My daughter suggested I donate them to Soles4Souls, a shoe charity. I checked it out and was inspired. I decided to get rid of every pair that hurt my feet…unless they were really, really cute. Shoes that I hadn’t worn for the past year also went into the pile. My daughter-in-law suggested we have a Shoe Tea Party (or, as we put it, a party at which tea would be served). Everyone would bring shoes. 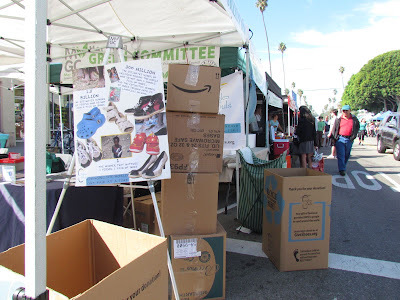 I sent an invitation to Sherri Akers and she suggested I collect shoes at the MVCC Green Booth at the Mar Vista Farmers’ Market. Julie Baylor of the Radisson LAX saw a posting about the shoe drive and asked if the hotel employees could participate. They’re back again this year! Miss Earth USA also collected shoes and brought them to the Farmers’ Market, including an autographed pair for the Soles4Souls shoe museum. 2nd Annual Shoe Drive for Soles4Souls - 2nd Chance! SAVE YOUR SHOES. Last year our generous community donated over 800 pairs of shoes to the charity Soles4Souls. That’s a lot of shoes! Melissa Stoller, drive organizer, is collecting shoes again on November 6th at the Mar Vista Farmers’ Market MVCC Green Committee booth. Soles4Souls offers a simple way to help reduce the strain on our environment: donating gently worn footwear. Soles4Souls saves these shoes from early death in a landfill by distributing them to needy people around the world. Recipients treasure this gift for years to come; for some, it’s their first pair of shoes. Since its inception following the Asian tsunami, Soles4Souls has distributed nearly 15 million pairs to people in 127 countries, including the United States. Start cleaning your closet now. Soles4Souls wants all types of shoes, from your kid’s outgrown tennis shoes to those rarely worn heels. Look in your closet and ask yourself, “Am I really going to wear these shoes again?” Every pair can make a difference. Remember, this is about RECYCLING as well as helping others. Please bring you donation in a reusable bag—or stuff them in an old pillowcase. You can dump your shoes in the collection box and keep your bag for another use. Want to help? Employees at the Radisson LAX are collecting shoes again this year. Perhaps your school, sports program or business can collect shoes for the drive. Melissa also needs help sorting and packing the shoes, as well as boxes to pack them in. Contact Melissa Stoller at melissa@stollerdesign.com. Good works deserve perks! 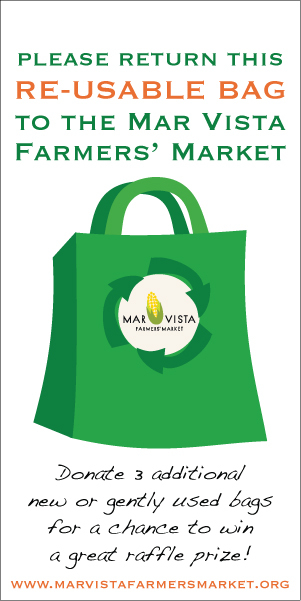 Donate your new or gently-used reusable bags to the bag exchange program at the Mar Vista Farmers Market and receive raffle tickets (3 bags gets you 1 ticket) for a chance to win our eco-centric prizes. Winner need not be present. 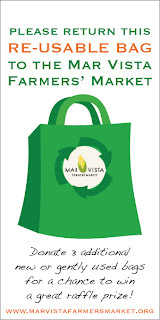 Just drop by the MVCC Green Tent any Sunday. See our first give away above - the Veggie Bed! 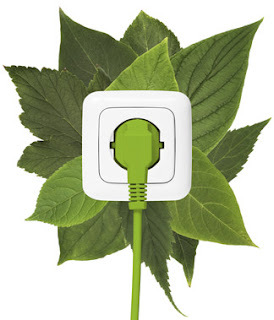 FREE Sustainable Works Business Greening Program! The program provides up to 10 hours of free green business consulting over a 3 month period – including onsite visits and guidance on implementing new measures. Check out the attached flyer describing the Business Greening Program grant. Contact Edward Pakdaman as soon as possible to avoid being put on a wait list! In addition to their usual giveaways of plants and seeds, this month, the UCCE/LA County Master Gardeners will be joined by Lynn Sanderson, Communications Specialist for the Citrus Research Board, who will bring materials to help you identify a deadly pest and disease that could wipe out our citrus trees, the Citrus Psyllid. While the plant nursery world is aware of and taking preventive actions, it's the backyard gardener who will be the vanguard in preventing its spread from one tree to the next. So come, get educated, and let's keep our area safe for citrus. Meet Food & Water Watch! 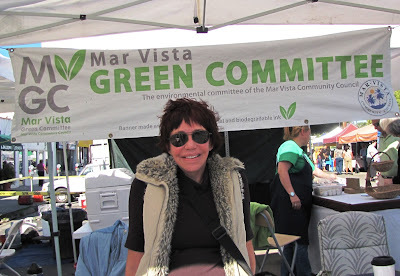 Stop by the MVCC Green Tent at the Mar Vista Farmers Market on Sunday October 16th to learn what Food and Water Watch is doing to promote local food! Since 2006, the consumer advocacy non-profitFood and Water Watch has promoted equitable access to safe drinking water, and the return to local and sustainable food systems. Currently, the national organization is advocating for a Fair Farm Bill, which will protect small farmers ability to compete, as well as consumers’ choice in regards to healthy food. Food and Water Watch works closely with local community organizations to empower individuals to take command of their food options. Although active at the local level, the organization ultimately works toward changing the national dialogue on food issues, and the power relations within the system. Food and Water Watch is always looking to partner with local members of the community, and local community groups—join the movement and find out how Food and Water Watch benefits you!